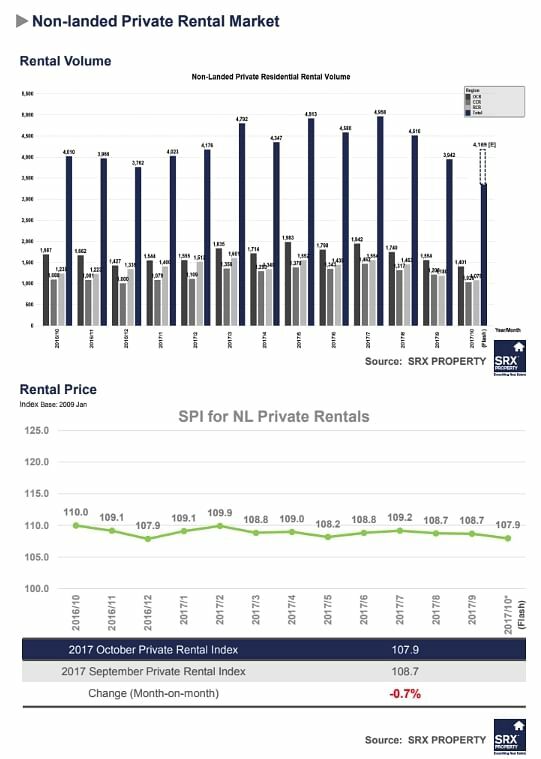 SINGAPORE - Private non-landed home rents fell by a steeper 0.7 per cent in October from a month ago, compared to a 0.1 per cent dip in September, flash estimates from SRX Property on Wednesday (Nov 15) showed. The main drag in October came from the prime region called the Core Central Region, which saw rents drop by 1.4 per cent in October, followed by a respective 0.3 per cent fall in both the city-fringe region known as the Rest of Central Region (RCR) and the suburban area or Outside Central Region. From a year ago, rents in October were 1.8 per cent lower, with the RCR posting the biggest decline of 2.5 per cent. They were down 19.7 per cent from their peak in January 2013. 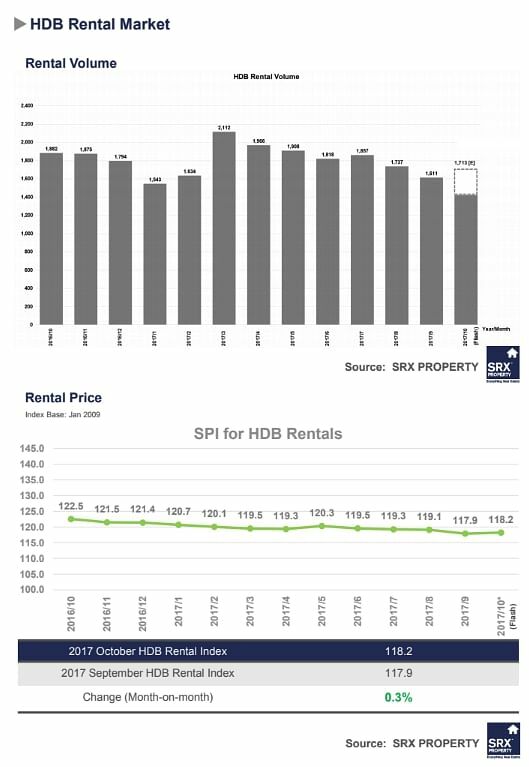 In the HDB space, rents inched up 0.3 per cent in October from a month ago, SRX Property's flash estimates show. This time, buoying the index for public housing rents were mainly HDB 4-room flats and HDB executive flats that saw rental increase of one per cent respectively, followed by the 0.3 per cent rental rise in HDB 3-room flats. These offset a 0.5 per cent rental decline for HDB 5-room flats. Rental volumes for both private non-landed homes and HDB flats improved in October. SRX Property estimated that some 4,169 rental transactions for non-landed private homes took place in October, marking a 5.8 per cent increase from the preceding month and 4 per cent from October last year. An estimated 1,713 HDB flats were rented in October, a 6.3 per cent increase from September this year but a 9 per cent decline from October last year.